Established 2011 when I discovered I have a hidden talent of painting childrens faces! Gone are the days of simply popping a dot on their noses and a few whiskers, kids want masterpieces! Visit our gallery to view some of our work and you'll see what we mean. Using top quality water based make up from around the world we are professional, reliable and talented artists that will delight everyone we meet, young and young at heart! For Face Painting with the WOW! 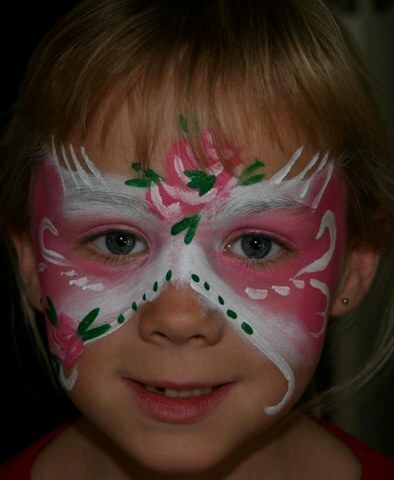 factor, look no further than FacePainter.co.nz for your next special event. Why not consider a fairy themed event or glamour party for a special group of girls? A monster or pirate themed party for boys! Or a jungle theme to suit everyone? We come prepared with a range of sample designs to help your guests make their choice, but will gladly research and prepare for a specific theme you have in mind - please just ask. Minimum fee $60 for 10 children then $5 per child thereafter plus a mileage charge of $1.00 per km from our Studio. What if I don't have 10 children? No trouble, the minimum charge is $60 plus mileage. 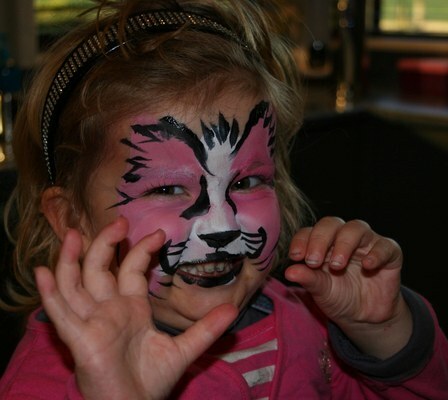 And don't forget there's probably parents there too, they often loving getting face painting done! What if I have more than 10 children? It's $60 per party of 10 children then $5 per child thereafter plus mileage. So if you have 20 children the cost is $60 plus 10 x $5 = $110 plus mileage. Can you do corporate functions? Yes we can, corporate rates are $100 per hour per artist with a minimum booking time of 2 hours. Your company will be sent an invoice on completion of the work, payment is expected upon receipt of the invoice. A $30 non-refundable deposit is required within 3 workings day upon receipt of confirmation of booking. An invoice will be emailed (or posted) to you confirming date, time, location and numbers. You will be given an invoice on the day for the balance of which payment is expected then. How will I make payment? Preferred method is cash however we're happy to receive payment by internet banking. Payment made by internet banking must be made in full prior to the party. What if I don't pay my deposit? If you don't pay your deposit within the 3 working days after receipt of confirmation of booking, your party booking will be cancelled without notice to you. If for any reason you can not make payment during this time please contact us to let us know so we don't cancel your booking in error. We will take bookings right up to the day of the party provided we have the time available, but to avoid disappointment make your booking as soon as possible. What age is suitable to be painted? We recommend to paint from 2.5 years to 103 years! Some younger children may be happy to be painted. If any child doesn't want to be painted we will not force them, afterall it's about having a fun time at a party. What paints do you use and are they safe for use on skin? The brands we use are Snazaroo and TAG. These have past Cosmetic regulations in Australia, USA and UK and are all designed purely for the use on skin. No trouble, 48 hours prior to the party we'll get you to call into the Studio with the child and we'll do a skin patch test. This involves us putting a wee bit of face paint behind the ear or on the wrist and if you get any redness or irritation in the hours following then it's no go for this child. Otherwise it's party on!